Now, to start, I wouldn't necessarily call this a cafe, but I'm not sure what else I'd really call it either. I'm kind of stuck on the type of fairing I want to roll with. I've got an original Read Titan, a Rickman, and an original off of a factory Norton racer. The Titan I can rep out of a mold and be done with it in a couple hours, the others will require a lot more work. Do any of you guys have any recommendations on some of the vintage bikini style fairings? If I go with one of mine, I'm going to have to chop it all up anyways, I'm thinking a bikini may be an easier route. 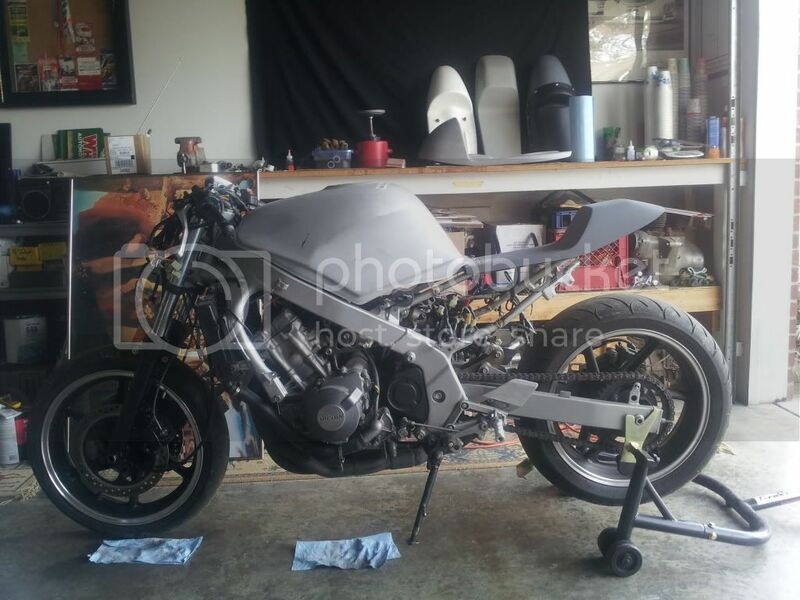 This is the bike as it sits right now. I'm getting a new subframe welded on, and everything braced, and in place right now. Also, any recommendations on a smaller radiator? The bike isn't going to be wrapped in a full fairing, so it'll get plenty of air, so I'd like to get the gawky radiator out of the way. I've seen a few sport bikes that have been done with a dual set up, with extremely small units. But, I've no idea who built them, or what they used.